These elements represent the areas of our homes and our lives that can benefit from smarter technology. The perfect smart home incorporates and seamlessly integrates all 5 elements. Note: many of the products listed here require a proprietary hub or controller to get started. This includes SmartThings, Insteon, Wink, Phillips Hue and many others. Before you buy any smart product, make sure you have all of the required hubs, apps or services. Nobody likes getting a shiny new product home and then realizing they don’t have all the necessary parts. Nearly every home consumes electricity, gas, water and other utilities on a daily basis. Homeowners are reminded of this every month in the form of a big, fat utility bill. Unless you’re made of money, you’re probably interested in ways to lower these bills. Smart homes should help you save money by being energy efficient. They should learn your energy use patterns and anticipate your needs. By learning and adapting to your habits, smart homes can use the perfect amount of energy. Nothing more. Energy efficiency products include smart lighting, learning thermostats, smart electrical outlets, power meters, etc. The home is at the center of our lives. Whether it’s a farmhouse in the country, a loft in the city or a friend’s saggy futon, everyone kicks off their shoes and sleeps somewhere every night. Couples have candlelit dinners and listen to jazz. Parents tuck their kids into race car beds. Teenagers run over the shrubs when they’re learning to drive. The home is a beautiful and sacred place, but that doesn’t stop bad weather or bad people from intruding. Smart homes should keep an eye on things 24/7 so you don’t have to. They should remember intrusions or disturbances so you can review them later. Nobody wants to worry about the security of their home, which is where smarter technology can carry some of the burden. Security products include cameras, motion sensors, environmental sensors, locks, etc. This is the part where smart homes start to feel like the future. Energy efficiency and security are important elements of the smart home but there are many more activities to be streamlined and automated. Smart homes should make accomplishing everyday tasks more convenient and enjoyable. They should reduce friction throughout your day and help you get more done. Everyone has a different opinion of what should be smart and automated. Everyone has even stronger opinions of what shouldn’t be smart. The available products are as diverse as these opinions. The current offerings are hit-or-miss, but I believe this element has the most potential. What is your favorite restaurant? Favorite coffee shop? Favorite nightclub? Besides the food and drinks, why do you like these places so much? Maybe it’s the indie playlist that’s always spinning your favorite songs. Maybe it’s the industrial style lighting that always gets the mood right. Maybe it’s the memories of Summer ’08, drinking Sangria on the balcony with friends. Atmosphere describes the way a place makes you feel. It’s the ambiance and energy that surround you and it’s not just for hippies. It’s real. Smart homes should provide a comfortable atmosphere tailored to your preferences. They should know who is in the house and what they like. They should understand your current mood and react accordingly. Temperature, air quality, lighting, music, furniture and much more contribute to a comfortable and inviting atmosphere. So you’ve made it this far. You have the most energy efficient, secure, convenient and comfortable house on the block. What’s next? What good is the world’s most efficient home if it’s also the world’s most sterile, boring home? Smart homes should do cool things for the hell of it. Smart technology can bring art and entertainment to you in a whole new way. Host an epic movie night and control the TV with your voice. Throw a dance party. Make every light in the house match your favorite team’s colors on game day. Go crazy. Be careful though, these toys aren’t cheap. What’s the most important element in your home? 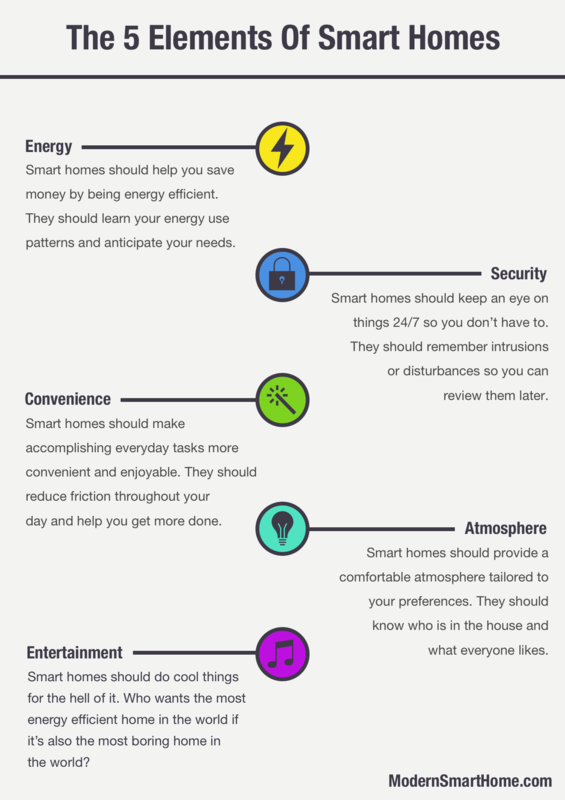 Share in the comments and subscribe to our newsletter below for more smart home articles like this. And stay tuned for more in-depth analysis of each element in the future. Thank you for this interesting article. These five elements will act as the fundamental points of development in the upcoming years, with each element becoming more capable while still maintaining their high integration with other elements. Love the infographic. I think sometimes we forget that smart tech should make our lives easier, not harder. Thanks Nicole! There is definitely a balancing act between cool features and usability. You can do some amazing things with smart tech, but it isn’t magic. The coolest systems with the most features usually require a lot of effort to install and maintain. The simple systems that are effortless to maintain tend to not have the bells and whistles we want. I think we’re headed in the right direction though.